The same thing happens every summer. Ryan starts getting excited about yard work and while I don’t even pretend to share that excitement, I do get excited about planting fresh herbs. And then, every summer without fail, I find myself overwhelmed by the bounty, particularly when it comes to basil! Our basil plant is suddenly larger than life and the faster I pick the leaves, the faster they grow back. Next thing I know, I’m frantically searching for recipes that use mass amounts of basil. More often than not, I make a huge batch of pesto and then start searching for ways to use that up. These picnic sandwiches are some of our favorites (and yours too—they’re pinned like crazy on Pinterest! ), as well as this pizza and this quiche. Now we can add this salad to the mix. 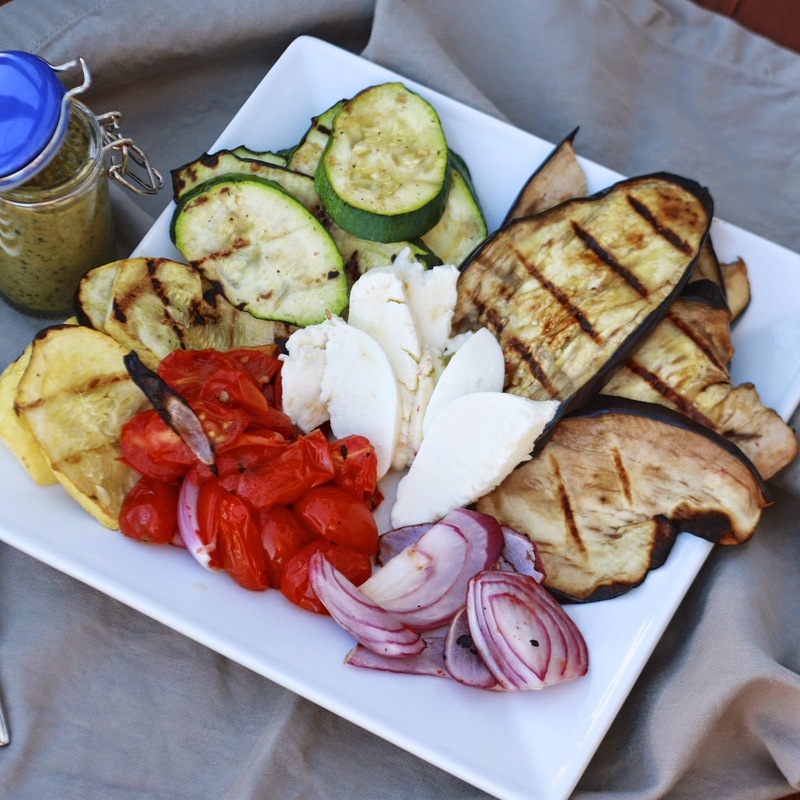 It’s pretty basic, just a pile of grilled vegetables and mozzarella, but the balsamic pesto makes it truly something special. This time of year we typically gravitate to simpler meals anyhow, but I guarantee you’ll be perfectly satisfied by the time you’ve cleaned your plate. 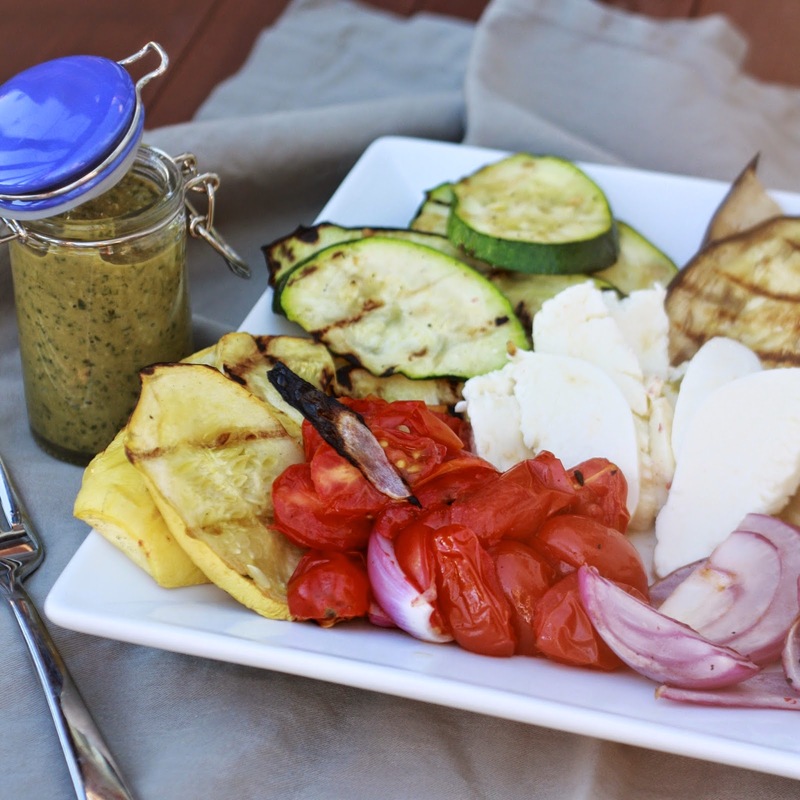 Add some grilled pita or grilled chicken alongside to bulk it up if you want, the pesto would be excellent on all of the above! And now, please help me, favorite uses for basil or pesto?! Leave them in the comments! 1. To make the pesto, add garlic, walnuts, and basil to a food processor and process until finely ground. Add remaining ingredients and process until smooth. Transfer to a small bowl, cover, and chill until ready to serve. 2. To prepare the salad, preheat the grill to medium-high. Coat vegetables and tomatoes lightly with olive oil and grill in grill baskets 7-10 minutes, until tender and grill marks are visible. 3. Arrange vegetables, tomatoes, and cheese on a large platter. 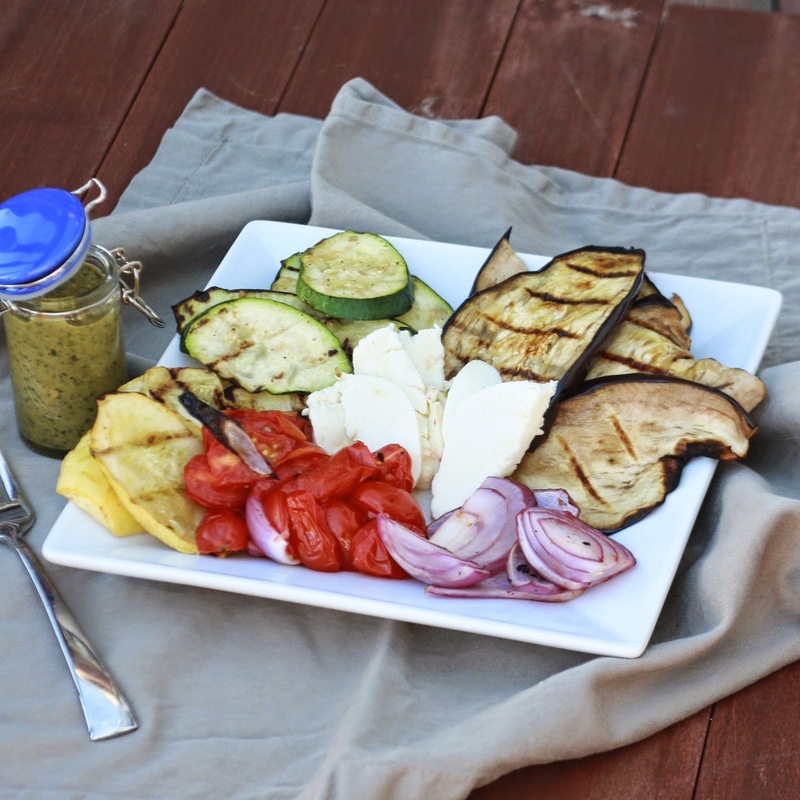 Drizzle with prepared pesto and serve immediately. from Cooking Light Lighten Up, America!